Stefan Milenković was born on January 25th, 1977 in Belgrade. 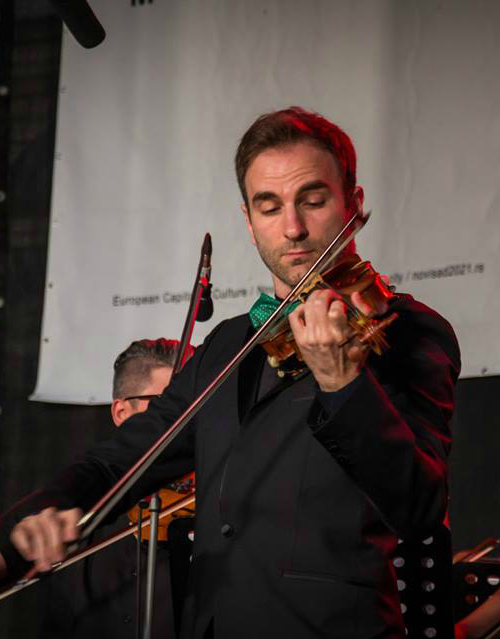 First violin lessons, when he was three years old, were given to him by his father Zoran. Three years later he had his first performance as a soloist with orchestra. He attracted worldwide attention as a ten year old. After the invitation of the US President Reagan to play at the White House, he was also invited to perform in front of the Soviet President Mikhail Gorbachev (in Belgrade), and Pope John Paul II, and after that the development of the young artist went shining upward. One of the most prominent Jubilees he had when he was only 16, playing in Mexico his thousandth concert. After 1994, as the youngest graduate of the University of Arts in Belgrade, he was invited to study at Juilliard, where he worked with Dorothy DeLay. In 2003 he was appointed corresponding member of the Juilliard School. As a true representative of the elite culture, he accepted the invitation of “Novi Sad 2021” team during the candidacy for the title of the European Capital of Culture, to perform in Novi Sad and thus send a strong message to the world that Novi Sad deserves to be European Capital of Culture! He held an unforgettable concert in Katolička porta, accompanied by the Novi Sad Chamber Ensemble “Camerata Academica”. On that occasion he emphasized that for him Novi Sad “has always been the European Capital of Culture”, and obtaining the prestigious title would be “just a formality”. The versatile young artist Manja Mikić was born in 1975 in Novi Sad, where she graduated from the Academy of Arts. She lives and works in Rome, but besides “the eternal city” she works and exhibits in Zurich and New York. She managed to form her own artistic expression and technique which allow her to show her artistic research – achievements in an abstract painting she has applied in the realization of unique portraits. She is not postmodernist, but for her paintings we could say to be postmodern. Works of Minja Mikić, which are increasingly taking their place on the world art scene, are displayed in Rome at the “Galleria della Tartaruga” and “Galleria Edieuropa”, in the “Urban Art,” in New York as well as in “Kunsthaus” gallery in Zurich. The biggest “recognitions” she has experienced in Italy. Her works called “Soul and body of Italy,” were part of the presentation of the Italian national team at the Olympics in Rio. She also had the honor of representing the Italian Art in New York, on the occasion of Apennine republic last year. Now she has the opportunity to promote her hometown and with great pleasure she accepted to be the ambassador of Novi Sad as the European Capital of Culture. 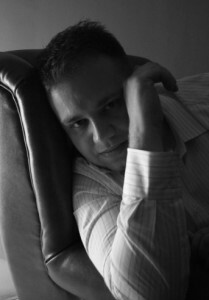 He was born in 1979 in Novi Sad. He made his first steps in the world of photography in 1986. Since then, he has passed all of its phases, both analogue and digital. Photography is his passion and the way of life. He mostly photographs city landscapes, nature, children and events. He likes challenges and travelling, and doesn’t miss a chance to photograph something new and different. He lives and works in Novi Sad. Aleksandar Milutinović was suggested by you, citizens of Novi Sad. You drew our attention to his original approach in representing our city. As he says, lately he has been focusing to the city where he was born in which he grew up. He tries to immortalise the moments from squares of Novi Sad, its events, people, architecture which is a contract between old and new. His project ‘Novi Sad through lens 365 days’ offers a new angle from which we can observe the beauty of our city. Take a look how Aleksandar sees Novi Sad on his official pages www.aleksandarmilutinovic.com and www.facebook.com/fotoaleksandarmilutinovic. Become an ambassador of the Project Novi Sad 2021 or suggest one! Tell everyone how important it is for Novi Sad to become the European Capital of Culture in 2021. 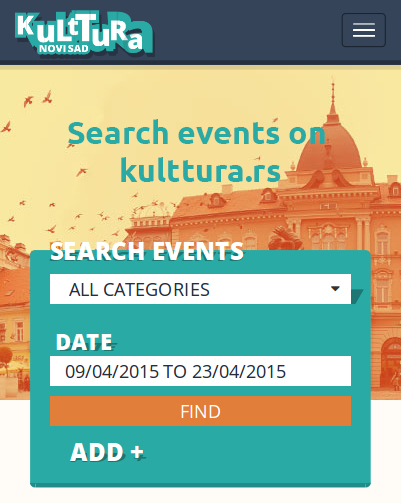 Write at info@novisad2021.rs.